I talked yesterday about a word for “sailor”, shipman, that most likely jumped ship from the S.S. Chinook Jargon and took up residence in Hul’q’umi’num’ Salish of southwestern Vancouver Island, Canada — so today let’s pursue the theme with a synonym. 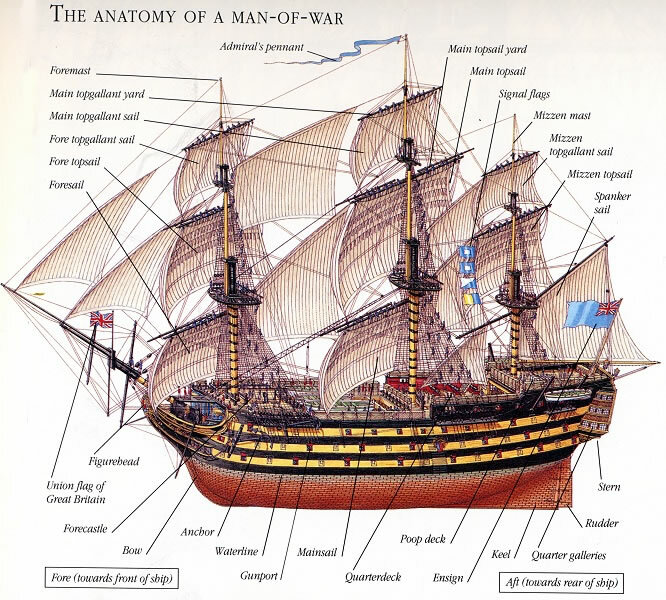 The English expression “man-of-war“ refers to a type of powerful sail-propelled warship that was in use by the British into the 19th century. Paradoxically, it doesn’t denote a human. Note that the Makah language has undergone a shift that made its nasal sounds pronounced like you have a cold. That’s why the original “m” turned into a “b”, and the English “n” became “d”. The Makah word also carries a suffix -ʔatx̣ that means “people”. It’s not native to either of these unrelated languages. It’s from the American side of the Strait of Juan de Fuca, where you’d expect less contact of Aboriginal people with British vessels. It dates back to the days of the man-of-war, which was phased out after the invention of the screw propeller. This in any case preceded any significant non-Native settlement or really sustained contact along the Straits that could have led to much direct contact with the English language as she is spoke. The most frequent vector for words of ultimately English origin to enter Aboriginal languages of this region was Chinook Jargon for a very long time. Even the relatively latecoming concept of “railroad” (generally in the form lilud in numerous Aboriginal languages of Vancouver Island; stim kar around Kamloops) bears the earmarks of transmission via Jargon. The pronunciation of a Jargon word such as we’re discussing would have been approximately the Klallam form. The Makah version, aside from the consonant changes I pointed out, has about the same vowel sounds, with short a being schwa-like and long a· more like English “ah”. So: mə́nuwa. Spoiler alert: there is a third borrowed word regionally for a member of a ship’s crew, showing up in Nuuchahnulth as siilas — i.e. from English “sailors” but used as both singular and plural. Rather than blog separately about that, I’ll leave you betting dollars to donuts that it too came in on the tide of Chinook Jargon.